Who said the Fijian Touch Cup was all about rugby?! With matches finishing at 2pm each day you have heaps of time to chill out in paradise! 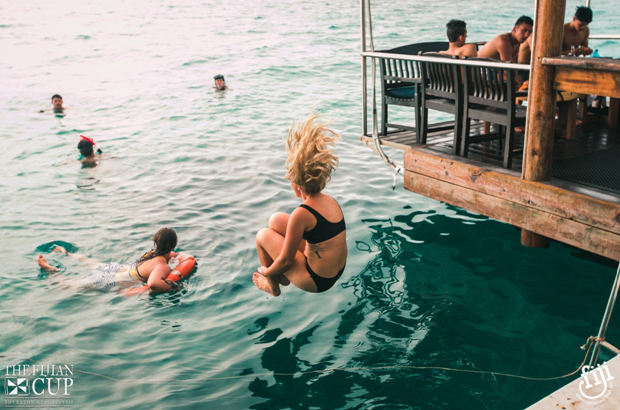 If you wanna make the most of your time in Fiji you should check out our awesome activities. You may just want to kick back and enjoy tropical cocktails at the poolside bar, or perhaps you’ll want to get your tan on down at the beach, or perhaps you’d like to be a little more active? Many of these activities are included, and unlimited, in your package deal! Included in your package is kayaking. Whether you want a single or a double kayak it matters not! The water in Fiji is so clear that you can spot all kinds of marine life from the comfort of a kayak. If you’re heading to the Fijian Touch Cup with your teammates and need to get a little last minute arms session in this is the perfect activity for you. Just kidding! The crystal clear calm sea is a joy to experience in a kayak and it’s an ideal way to see Fiji’s island landscape from afar. If you love marine life you’ll be delighted to hear that snorkelling is too included in your package deal. Flippers, masks and snorkels are all provided for you and you’ll be amazed by the abundance of marine life that you can see within metres of the shoreline. Be sure to bring your GoPro with you, you’ll want to capture all the underwater action we’re sure. If you and your teammates are looking for an active recovery session it doesn’t better (or more fun!) than stand up paddle boarding. This is another of our complimentary activities and its perfect for all the team. One great thing about paddle boarding in Fiji is that if you fall off you fall into the warm Pacific Ocean rather than the chilly Tasman like you would at home! Our hosts, the Sheraton Fiji, are a 5* resort and so it seems only fitting that they have a 5* spa complex to match. We have collaborated with their team to create an incredibly relaxing and luxurious half day spa package for guests joining us for the Fijian Touch Cup. This is an activity open for all and yes, they do offer treatments for guys too! After a big day on the pitch a visit to the Sheraton Spa is the perfect way to soothe those aching muscles! We’ve already told you that your Fijian Touch Cup experience will be the time of your life but we can literally take you and your team to Cloud 9! Cloud 9 is Fiji’s only multi-storey floating party venue, complete with classic Italian wood-fired pizzeria and cutting edge sound system. Cloud 9 host an awesome team of DJs who bring the party to the next level. If you and your team are looking to blow off some steam after a day on the field you’ll be blown away by the Cloud 9 experience. PLEASE TELL ME WHAT PLACES THEY VISIT! For all you big kids out there you’ve gotta book your spot at the Big Bula Waterpark. A total novelty, yes, but after busting a gut out on the pitch the Big Bula Waterpark is the perfect place to unwind and mess around. Some may argue there is such a thing as too much fun but we don’t believe them! If you wanna experience the world’s largest inflatable water park you better book you and your team’s spot ASAP. With countless crazy water slides, climbing walls and water trampolines you’ll laugh your sock off at Big Bula Waterpark! If all that sounds like a lot to cram into three days in addition to a world class touch rugby competition, you’re right! If you want more time to relax and play in paradise remember that we can deduct $600 from your package deal so you can extend your stay in Fiji by arranging flights that suit you! A word to the wise; activities like the spa experience, Cloud 9 and Big Bula fill up pretty quick so if you and your teammates don’t wanna miss out you better get booking ASAP!